'This Family Is Fractured,' Says Sister Of Miner Killed In West Virginia : The Two-Way And Judy Jones Petersen is speaking out because she's convinced that "if everything had been running properly," in the Upper Big Branch Mine, "no life would have been lost that night." 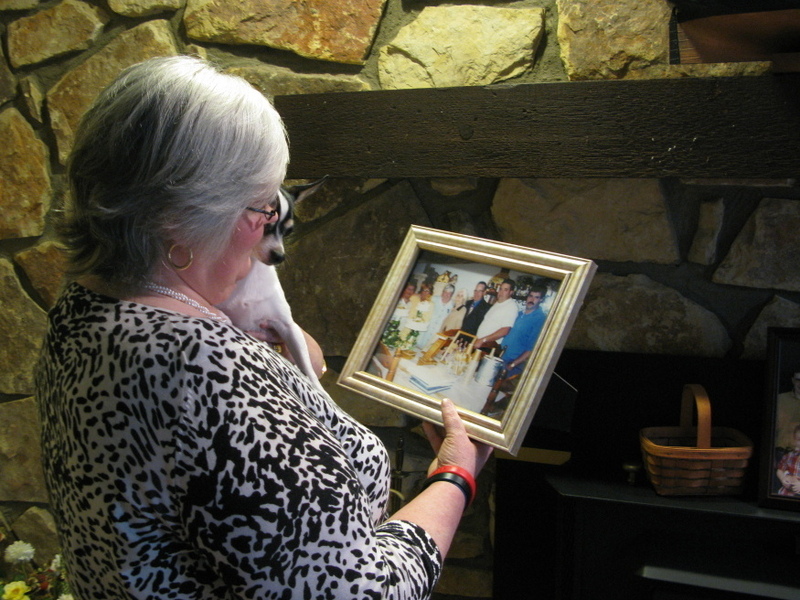 Judy Jones Petersen, with a treasured photo of her family. This has been a pivotal week in the investigation into the coal mine explosion last year in West Virginia that left 29 mine workers dead. The Mine Safety and Health Administration said there were multiple failures in maintenance and safety systems that contributed to the blast. This was difficult news for the families of those who died and most have kept their reactions private. But as we reported today on Morning Edition, the sister of one lost miner decided to speak out. She's Judy Jones Petersen. Her brother, Dean Jones, was killed (we've previously reported on his twin, Gene, and the pain he's gone through since losing Dean). The photo on the mantel is from a time when the Jones family was whole. And everybody in it is smiling. Judy Jones Petersen smiles, at first, as she pulls it down, holding her white toy Chihuahua in one hand and this treasured memory in the other. "My mother, this beautiful saint, this angel, has not only lost my sister … and my dad," she says. "But the losing of my brother has really taken its greatest toll." 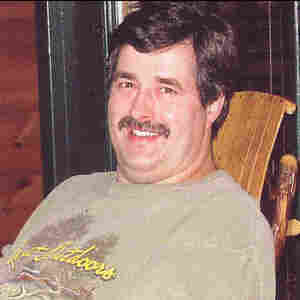 Dean Jones was 50 when he died last April 5 in the Upper Big Branch coal mine in West Virginia's Coal River Valley. Judy is six years older than her brothers. Judy was six when Dean and his twin brother were born. Now, she says, "this family will never be the same again. This family is fractured. There's no healing this family." Tuesday night, Petersen traveled from her Charleston home to an auditorium an hour away, where families who lost loved ones in the Upper Big Branch disaster had gathered. It was finally time to hear the official explanation, in a preliminary form they were told, of how and why their loved ones died. She wasn't happy with what she heard. "I could never have believed that there could have been such neglect," she says. "To allow this mine to be so far out of compliance … if everything had been running properly, no life would have been lost that night." Dean Jones was at the far end of the blast with a crew of eight. He was the section boss with 30 years underground. Judy says her brother "was an obsessive compulsive person about these issues of safety. But unfortunately the company standard would not allow people like my brother … to look after the safety of his men." Dean's mother-in-law testified before a congressional committee about alleged threats of dismissal when Jones stopped his crew from producing coal in unsafe conditions. She also testified before a federal grand jury. Jones stayed on the job, his sister says, because his son has cystic fibrosis, and might be difficult to insure if his dad switched jobs. That's how Judy Jones Petersen explains the pressure miners in general may have felt to quietly tolerate the conditions at Upper Big Branch. But she has no patience for mine owner Massey Energy for allegedly allowing such conditions to exist. "Where is the integrity in this system?" she asks. "That has to change. That culture must change. And the reason I'm doing this [speaking out], Howard, is y'know, I can't change anything about the wounds that have occurred for my family. But I don't want any other family to have to suffer what my family has had to suffer." Petersen is a physician, so she knows suffering and physical trauma. And she was one of the few family members who asked to see battered remains of their loved ones. "I wanted to know from a scientific point of view how much force was generated … on my brother." she says. And, she wanted to try to "make a decision about whether or not my brother suffered. And when I looked at my brother in the body bag, um, it was, it was, my brother was unrecognizable to me." Massey Energy had planned to conduct its own family briefing today but postponed it until next Friday because of a winter storm. Judy Jones Petersen says she'll be there, with vastly different images of her brother Dean etched in her memory, and armed with tough questions.